8bitone puts '80s sounds in the palm of your hand. 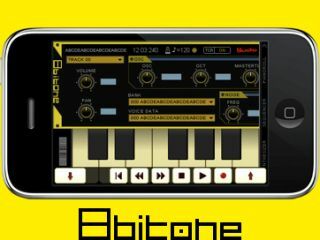 Somehow, the iPhone/iPod touch platform seems like the perfect place to be making 8-bit music at the moment, and owners of the aforementioned hardware will soon have the opportunity to do this thanks to Yudo's 8bitone app. Slated for release in June, this contains a simple monophonic synth that features a single oscillator, LFO, envelope and arpeggiator. There's also a piano roll sequencer that enables you to create up to four tracks. Sounds can be edited on the Synthesizer screen, and songs can be transmitted back to a computer that's connected to the same Wi-Fi network as your Apple handheld. No news yet on how much 8bitone will cost, but if you want to find out how it looks and sounds, may we suggest that you watch the clip below.